I am a handbag freak...which you wouldn't be able to tell as of late, since I've mainly been using the canvas tote bags that I have made. I can't seem to justify using my nicer handbags when they'll just end up in the bottom basket of a stroller, getting dusty and possibly wet with each push. So since the wee one has been born, my handbag collection has been sitting on the top shelf of my closet, collecting dust, begging to be used. But alas, 90% of my collection is not kid-friendly and can't fit all the things you need to lug around when you've got a one year old toddler to care for. One of the main reasons why the bag caught my eye so fast was because I've been on a hunt for a bag that was both stylin' and big enough to carry all my goods, as well as a few diapers and some kidlet treats. Not to mention that I've been searching for a nice dark brown leather handbag for a few years now, that doesn't resemble a miniature suitcase or contain ugly gold sliding buckles. The one and only brown leather handbag that I own is too light in color and rather than taking on a nice aged patina, it looks just downright dirty. All of which is quite sad cause the leather is so soft and the size was absolutely perfect. Lucky me, after much searching on the interwebs, I discovered that the designer and maker of Bella's bag, Angie Bowlds, has opened shop on etsy (stitchandswash) and now has her own website. Angie handmakes all of the bags herself in the basement of her Seattle home, and because the demand has been so high, each bag takes about 5 weeks to receive! ...you can see it in when she goes to Port Angeles and gets chased in a dark alley by bad guys. she also uses it to pack later in the movie when she runs away from Forks. 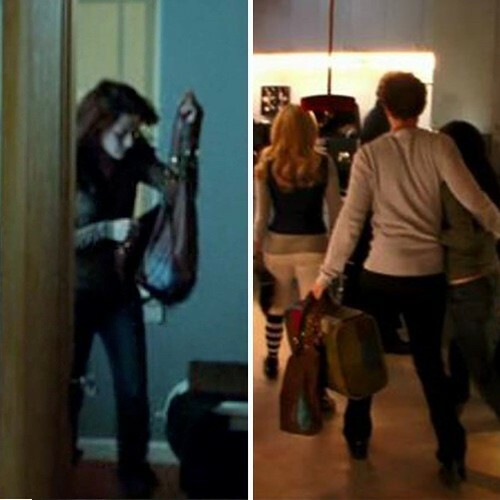 this bag can also be seen in the New Moon trailer! catch a glimpse of it hanging on the mirror when she's dreaming in bed. after seeing the movie I have decided to make this design available again to any Twilight lovers out there! 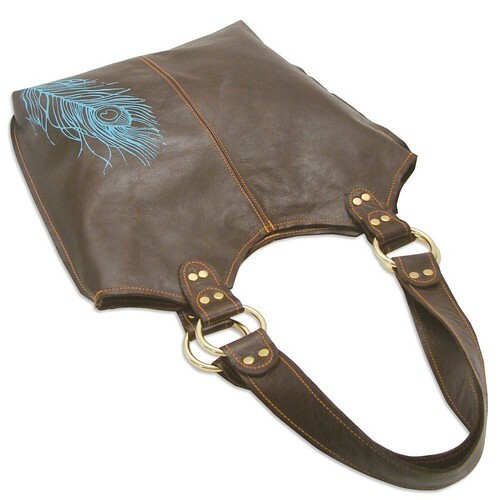 this bag is exactly the same as the large tote made for Twilight, with dark brown leather, rounded strap ends, brass rings, orange stitching, and an aqua peacock feather. lined with aqua cotton fabric, it includes a pocket, key clip, and a magnetic snap closure. the biggest bag I make, it's a great tote for school, work, running away with your vampire boyfriend - whatever!" I tried to find photos of the other scenes mentioned, but after 2 hours of searching the web and not finding anything, I decided to give up. I had also tried to do screen shots from a DVD, but alas, that did not work. Oh well. 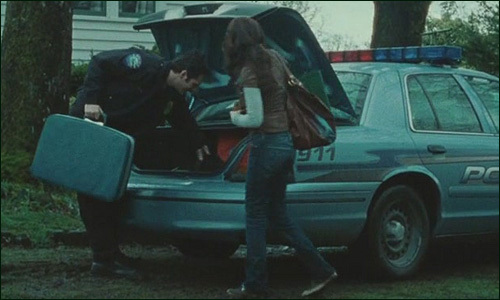 I'm sure if you are a Twilight fan, you'd know what scenes I'm talking about without me having to post a photo of it! So back to the bag...which really is quite large at dimensions of 16" x 14" with boxed corners. The straps are about 25” long, which is long enough to sling over your shoulder, yet short enough to drape over your arm (in case you need to shove your hands into your pockets). I'm sure if you're of average height you can also carrying the bag via hands, but I'm too short to do that without the bottom of the bag getting trashed from being dragged on the ground! The retails at $175 US and shipping is approximately $10-20 depending on where you are. But if you're in the US you're in luck, shipping is free! Lucky buggers! Some of you might be thinking $175 is a bit steep for a shoulder bag, but I think it's not a bad price tag for a handmade leather bag. Bare with me while I recount the numerous costing sheets I had to fill out back in school...first of all, think about how much the material costs, especially the leather and the hardware. Then think about the time put into hand cutting each and every piece needed to form the bag (and trust me, continuous cutting of leather is no easy task! ), on top of that, each front and back exterior piece needs to be silk screened with that aqua feather print - taking into consideration that special ink is needed for that, so add that to the cost of the bag. Lastly, think about the time and workmanship that went into actually making the bag. Whenever I ask people to think about that last part, I always get the response "well that still doesn't justify the hefty price tag". Oh yeah? So you expect the person who did all the work/sewing to get paid pennies per hour just so you can have a cheaper price tag? I usually help to break it down, like this: say the bag itself costs $40 to make, and the sewist charges $20 per hour for her time. The bag takes 2 hours to make. In total, it costs $80 to make the bag. But what about the other $95? Well consider the other overheads...like the fact that the sewist needs a place to do the sewing, so a few dollars can go towards rent...electricity is needed to run the sewing machine, a few dollars goes towards the electricity bill...a lot of time was probably spent in trying to find a reliable and consistent source for the leathers to create the bags, a dollar here and there to help with that...ditto for the cotton lining and all the hardware that goes on the bag...don't forget the packaging! A dollar or two goes towards hangtags and tissue to wrap each bag before they are sent in the post...and last, some entrepreneurs might have to pay business fees and taxes, so you can bet some money goes towards that. In the end, you just hope that you have a little bit of a profit to make it worth it for all this trouble. After all, this person has to make this same bag over and over and over and over...you get the picture. Sorry for the long-winded explanation/lesson of why the price of the bag is the price it's at. Now for all of you who are in the business, please don't go emailing me and/or leaving nasty comments about how my rant isn't 100% completely accurate. What I have just said is a general and basic guesstimate, not the exact formula that is being followed. I have simply stated some reasons as to why the cost of an item can be so high. I did this cause it really burns my cupcakes when people huff at the high prices for clothing and fashion related accessories. So back to the bag, which you can purchse here or here. Angie has great communication and trust me, you'll love your bag when it arrives on your doorstep! So true - anything handmade has so many hidden costs. So true! I think that is one main problem people selling handmade goods run into. People don't want to pay that much but they don't understand that they are paying for the time it took someone to hand make the item. And a lot of the times they are buying things that are one off as well. I find sometimes it's so hard to get non-crafters to understand what they are truly paying for. Not everyone knows that the majority of crafters are a one-woman show! (Then there's the random help from spouses and children from time to time) Kat, I completely forgot to mention the fact that most things really are one off. Thanks for reminding me!